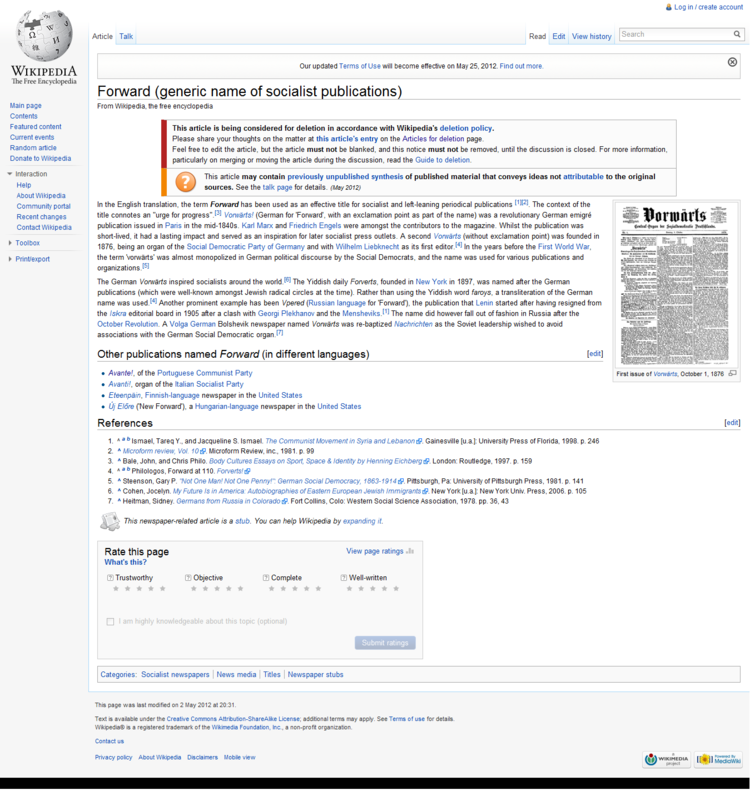 Wikipedia deleted the page “Forward (generic name of socialist publications)” which people where accessing to learn the Marxist history of “Forward” — the slogan President Obama has adopted for his 2012 campaign. Liberals are afraid of Americans knowing the truth. In the English translation, the term Forward has been used as an effective title for socialist and left-leaning periodical publications. The context of the title connotes an “urge for progress”. Vorwärts! (German for ‘Forward’, with an exclamation point as part of the name) was a revolutionary German emigré publication issued in Paris in the mid-1840s. Karl Marx and Friedrich Engels were amongst the contributors to the magazine. Whilst the publication was short-lived, it had a lasting impact and served as an inspiration for later socialist press outlets. A second Vorwärts (without exclamation point) was founded in 1876, being an organ of the Social Democratic Party of Germany and with Wilhelm Liebknecht as its first editor. In the years before the First World War, the term ‘vorwärts’ was almost monopolized in German political discourse by the Social Democrats, and the name was used for various publications and organizations. The German Vorwärts inspired socialists around the world. The Yiddish daily Forverts, founded in New York in 1897, was named after the German publications (which were well-known amongst Jewish radical circles at the time). Rather than using the Yiddish word faroys, a transliteration of the German name was used. Another prominent example has been Vpered (Russian language for ‘Forward’), the publication that Lenin started after having resigned from the Iskra editorial board in 1905 after a clash with Georgi Plekhanov and the Mensheviks. The name did however fall out of fashion in Russia after the October Revolution. A Volga German Bolshevik newspaper named Vorwärts was re-baptized Nachrichten as the Soviet leadership wished to avoid associations with the German Social Democratic organ. This page was last modified on 2 May 2012 at 20:31.